Our window boxes echo the style of our larger planters. They are made with the same care and high-quality finish as our other products, complete with a Tudor rose on each long side. Beyond their use as window boxes, they are also ideal as edging for terraces and decking, and for hanging over railings. 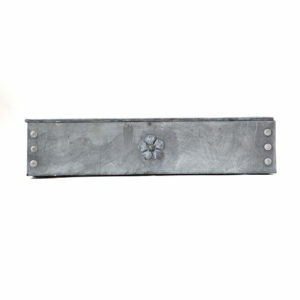 The window boxes are made from 1.5 mm galvanised steel. Their features set them apart from others: they have adjustable legs to make them level on a slanted window sill and aid drainage. Their bases are drilled to avoid waterlogging. – A tray to stop dirty water discolouring painted sills is available. The tray measures 87 cm or 112 cm x 17cm x 2 cm and weighs 1.5/2.5 kg.